"Fish Tank" is a raw and unflinching look at a teen girls coming of age while living in the cold, dank housing projects in Essex, England. The girl is Mia and she is played by first time actress Katie Jarvis. A fifteen year old who spends her time dancing in an abandon apartment. This isn’t your Black Swan type dancing but hip hop. 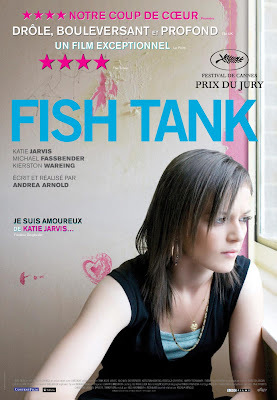 This film was directed by Andrea Arnold who won and Academy Award in 2005 for her short film Wasp, which takes place in the same world as Fish Tank. Mia is you average angst ridden teen. She is constantly fighting with her mom and younger sister. She doesn’t get along with other girls her age and her future is a fog. Her mother (Joanne) wants to send her to a boarding school to straighten her out. Joanne has a new boyfriend (Connor) played by the brilliant Irish actor Michael Fassbender, who forms an immediate connection with Mia. He is simultaneously a father figure and a teen crush for her. He is the only person that supports and encourages her dancing. He lends her a camcorder so she can make a tape to enter a competition. All of this seems too good to be true and it is. Mia’s trust is betrayed by Connor and she goes to extreme lengths to get back at him and teach him a lesson. She is called in for an audition for the dance contest and this is also not what it seems. The whole film sparkles in the way that things are not always what they seem or what you think they should be. Everything is painfully similar to real life and not some sort of Hollywood fantasy. Earlier on in the film Mia meets Jimmy a boy more her age while trying to free a sickly looking white horse from a junkyard. They develop a more natural and real relationship. Mia decides to leave home and go with Jimmy to Wales. Her mother can see Mia has no future where they live and doesn’t put up a resistance. The Fish Tank DVD and Blu-ray are available from the Criterion Collection.